Check out the Sip'n Puff Arduino shield. Pre-order yours today at Kickstarter.com. We offer a full line of products created for the rodeo, shooting and mounted shooting industries. Our products can be cusomized to meet your specific needs. The Range Master Go Light is a remote controlled traffic light design to help the range masters of mounted shooting keep the riding arena safe. It interfaces with the current line of FarmTek wireless timers to provide a simple one click solution. 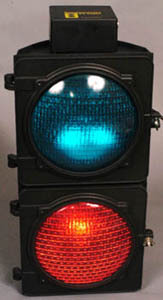 When the green light is given to a rider, it stays green and automatically changes to red when the rider breaks the timer beam. This eliminates the need for the range master to manually change the light back to red before the next rider enters the riding arena. The Range Master Go Light can be customized to meet your specific needs. The Range Master Penalty Counter is a remote controlled display that allows the range masters of mounted shooting to indicate the amount of penalties a rider is given during a ride. 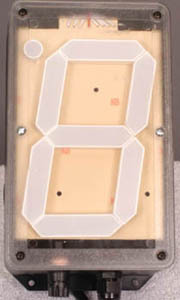 The penalty counter also interfaces with the CMSA Automation Software so that the penalties are automatically sent wirelessly in real time to the score keepers computer. Eliminating the need for hand signals and reducing to possibility of human error. 12 button remote control. Used to control the Range Master Go Light, Penalty Counter and other TMI Enterprises Products.